People who love the outdoors will attest to loving the water. Being able to take your inflatable kayak out on a calm lake will give you an entirely new perspective on the world. 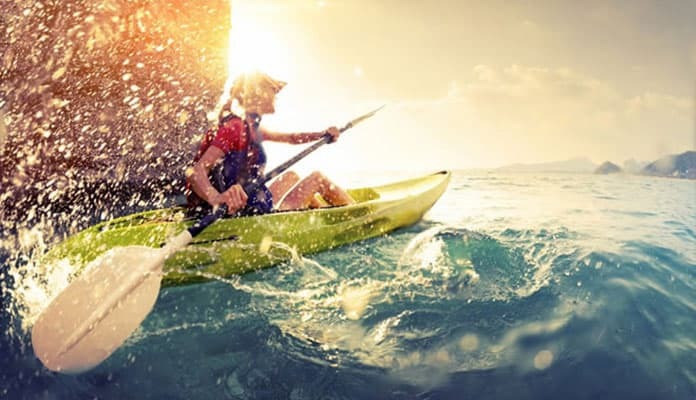 There are many water sports to choose from but a common favorite is kayaking. Often people turn to an inflatable kayak for an easy to transport water sport that they can take with them just about anywhere. Even into the ocean, surf or down a rapid river full of whitecaps. Having the best inflatable kayak will ensure you have a durable ride that has enough cargo space to take you and your gear on long adventures. We have scoured the web to find the best inflatable kayaks to take this sport one step further. This is the best tandem inflatable kayak for touring that is incredibly durable. With a 650 lbs weight capacity, it can fit a maximum of three people and a whole lot of cargo. Great for still water, or take it through the surf in the ocean. The spray skirt will allow it to glide over the surf without getting you soaked. 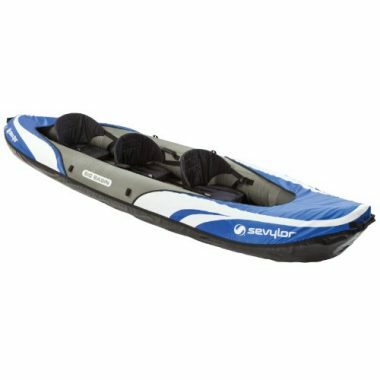 This Sea Eagle SE370 inflatable kayak is great for those going on extended trips, ensuring your cargo stays dry. No more faded or cracked material that can be common with inflatable materials. This kayak is sun resistant which means that it can handle extended periods exposed to the elements and still look just as good as when you bought it. This keeps the integrity of your board and extends the lifespan of your kayak. It is also saltwater resistant which is great. Now, you no longer have to limit where you go with your kayak. 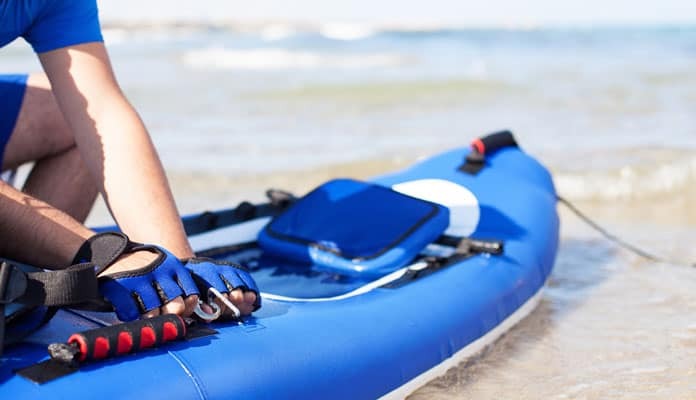 Coming with everything you need to get out onto the water, this inflatable ocean kayak even comes with a convenient carrying bag which makes transporting it even easier. 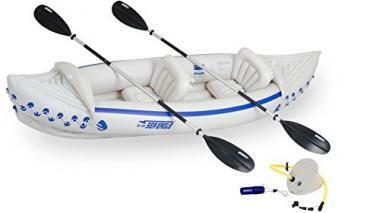 This is the best inflatable fishing kayak under 500 that is expertly built and can be used for single use as well and comfortably fitting two people. Expertly made using a durable vinyl that is puncture resistant. Not cracking or denting is only part of this blow up tandem kayaks charm. Two air chambers give you peace of mind that even if the worst case happens and you pop a hole in your kayak you can still stay afloat and get back to shore safely. The UV resistant finish allows you to spend long hot days in the sun without worrying about the integrity of your inflatable tandem kayak. The entire front of this sporty looking kayak is a mesh cargo area to bring lots of gear along with you. Pack a couple of dry bags and set sail into the open water with peace of mind that you have a sturdy and reliable kayak. 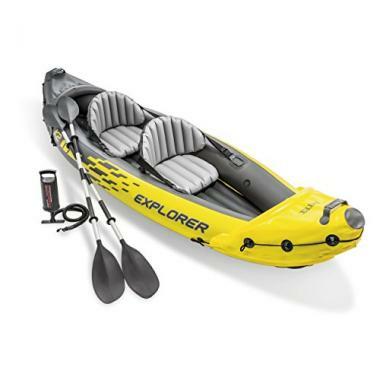 This Intex Explorer K2 kayak is great for your next trip out on the water. With an exceptionally high weight capacity, feel free to pack a cooler and your gear so you have everything you need for a day on the lake. Three separate air chambers ensure that if one pops, you have more than enough flotation to get you, and your gear, safely to shore. With six mesh pockets there is tons of storage on board allowing you to pack everything you need for the weekend. This is the best cheap inflatable kayak for flatwater that can transport two people comfortably and the high side walls will keep you dry no matter how choppy it gets. It also comes with everything you need to be fully prepared for your weekend, just bring food and a friend. Accessories: Two 86”aluminum oars and an Intex high-output pump for easy inflation and deflation. This is the best inflatable kayak for the money that will take you places you only dreamed of. The aluminum ribs and 3 layer puncture resistant material create a rigid heavy duty ride while giving you the portability of being inflatable. 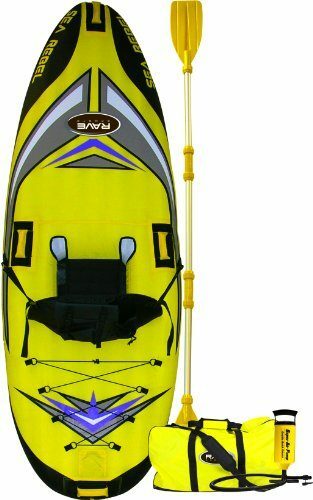 The Advanced Elements AE1012-R Kayak included adjustable seat is exceptionally easy to setup and attach to the kayak. It is also surprisingly comfortable and will allow you to paddle all day without getting sore. The 300-pound capacity will give you the flexibility to carry all your gear. A dry storage compartment is ideal to store all of your non-waterproof items such as a cell phone or GPS system. The bungee deck gives you the ability to quickly grab your fishing rod or a packed lunch. Don’t worry about fishing on this rig as it has a highly durable, puncture resistant material keeping you afloat. 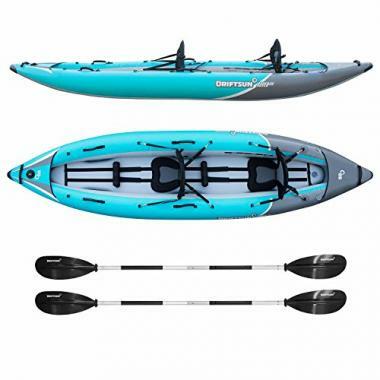 Coming in an excellent package that gives you everything you need to get you and your friend out on the water, this kayak is great for tandem or solo use. This means you can trade your friend for your pup and enjoy a serene day out on the water. We are impressed by its incredible durability, your pup’s nails are no match for this kayaks durability. This kayak is great for those looking for a calm day on the lake and those who seek adventure. Take it this inflatable kayak on the ocean or white water experience and watch as it expertly handles the waves. It is easy to set up and can be inflated in a matter of minutes getting your on the water faster. A convenient carrying case allows you ease when transporting this inflatable whitewater kayak. The Driftsun Rover 220 tandem inflatable kayak is an adventure ready kayak for families and thrill seekers alike. The Rover 220 is a 12.5 foot tandem style kayak. It inflates in less than 10 minutes when you use the high flow double action hand pump included in the set. All in all this kayak weighs just 28 lbs and fits into a small package (backpack included). Driftsun has made this kayak extra tough by using a PVC tarpaulin base and an 840D coated nylon oxford top coating. This makes the boat puncture resistant while the double threaded boston valves ensure it doesn’t leak. The Rover has also been thoroughly thought through when it comes to the nose and tracking. It cuts through the water with precision while the removable deep fin will help in choppy waters to keep you pointed straight. It has a v shaped hull which also gives it more stability for any water situation you put it in. Something this boat has that you don’t find on an inflatable boat is a rapid self draining plug. The Rover also comes with everything you need to jump in the water. This includes 2 padded seats, 2 aluminum paddles, hand pump, rear fin, repair kit and a travel bag. You will also be happy with the 2 bungee systems at the front and rear of the boat. Both passengers will be able to bring along all of their gear. 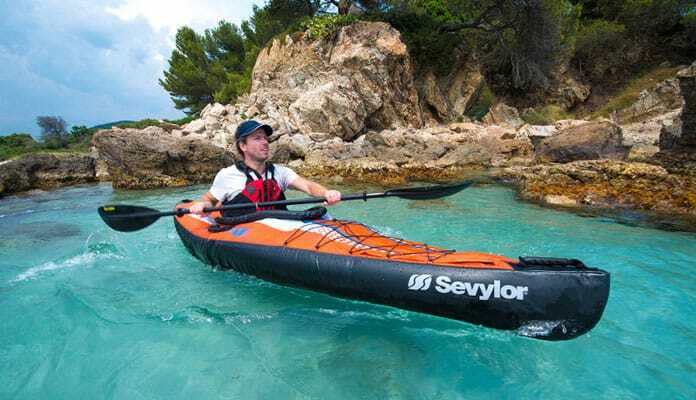 Sevylor is the best solo inflatable kayak for camping. They pride themselves on making some of the best kayaks on the market. The Quikpak K5 is named appropriately. It can be setup in 5 minutes allowing you to get on the water in record time. This kayak takes less time to inflate than most rigid ones take to get off your cars carrier. What is even crazier is that this entire system fits into a backpack - and then the backpack turns into the kayak’s seat. Yes, you read that right. The kayak itself is made from 24 gauge PVC which makes it incredibly durable. You won’t have to worry about scuffing the bottom of this boat as it’s made from a tarpaulin material. This makes it able to stand up to the occasional rocky shoreline. On the top of the kayak is a layer of polyester material which not only makes it puncture resistant but also softer against your skin. This entire boat has multiple air chambers so if you do have a catastrophic situation you will still stay on the surface of the water. The boat also has a double lock valve system that makes inflation and deflation a breeze. This boat also comes with extras that make your life easier including a spray cover and D-rings. These keep you dry and allow you to strap your waterproof duffel bags to the top of the kayak. If you are looking for the best whitewater inflatable kayak that is larger the Big Basin is the one you’re looking for. It is a true 3 seater kayak. Most companies boast about having a 3 person kayak option even though the boat doesn’t have 3 seats. Not Sevylor. The Big Basin actually as 3 seats that have loads of leg room. All of the seats also move so you can be as comfortable as possible. This is largely due to the high quality construction. It is made from a heavy duty PVC material that has a tarpaulin bottom. Both of these create a skin that is durable while maintaining a lightweight stance. A Boston Valve has been used which makes inflating and deflating as easy as possible. You can also use the included carry bag to easily get it from your house to the car and then to the beach. This is the best inflatable fishing kayak for fly fishing that is brightly colored and has been designed around you what you want. Everything from the seat to the storage placement will help you get to your destination and enjoy every second of it. This kayak is able to be used in lakes, rivers and even ocean bays. The seat is placed perfectly without much room behind it. This makes cruising through the water easier as you don’t have as much drag fighting against you. This kayak has features that make it easy to get into the water. A Twistlok and high flow spring valves make inflating and deflating this kayak super easy. 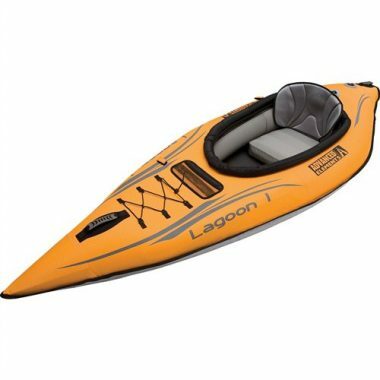 The Lagoon kayak has a padded seat that has an excellent hight. This is one of the features that companies seem to forget about - but not Advanced Elements. They have also integrated rigid panels on the bow and stern which helps with controlling the kayak through the water. If you are looking for the best inflatable kayak under 500 that is versatile than the Sea Rebel is the one for you. It’s essentially an inflatable stand up paddle board with a kayak seat. You won’t have to sacrifice storage either as it has quite a large bungee system just behind the seat. The kayak is also a great length at 8 feet. It is small enough for you to control and large enough for you to stand up and move around easily. It is made from a heavy duty nylon with a PVC tarpaulin bottom. This gives you a low friction contact point that won’t create drag through the water. Essentially, this means you’ll move fast through the water. The entire system weighs just 22 lbs and fits into a small included duffel bag as well so you can easily get the entire package from your home to the beach. Once you inflate it the 4 foam filled handles make launching it a breeze, even if you have to park a long way from the launch point. Rave knows they have spent the time to make a great product. This is why they include a 1 year warranty with the kayak. Kayaks are designed to be able to go anywhere. Paddling into the open water on a hot day provides peace and serenity. Now imagine being able to carry your kayak to the beach in a compact backpack. Often inflatable kayaks are around twelve feet in length which make storing them a challenge. Especially for those without roof racks or who live in an apartment, turning to an inflatable kayak will give you easy storage without compromising on durability. Being able to easily transport and store makes inflatable kayaks ideal for outdoor people who don’t have the space to store rigid kayaks. It also makes portaging your kayak much easier as you have the best option to deflate, and don’t have to worry about cracking your kayak. What Is The Top Rated Inflatable Kayak To Buy? There are many features to know and understand before you purchase your next inflatable kayak. We have constructed a best inflatable kayak for fishing review guide for you to consider before taking the plunge to purchase your own. Inflatable kayaks differ from their rigid cousins quite a bit. It is important to know the differences between the features. This is a water vessel that will transport you and possibly your children into open water so the material needs to be highly durable and strong. Since you will be deflating and storing it when you’re done it also has to be flexible and able to bend without breaking. When Zodiacs were first invented they used a material called Hypalon. It is an exceptionally durable material that doesn’t flex or bend. Because of this, it is heavy and can be cumbersome to move around. It is also very rigid for a fabric like material, retaining its shape for its entire life. For these reasons it is used for inflatables, but rarely used for inflatable kayaks. The most common type of material used to construct inflatable kayaks is PVC. This is a strong material that can be inflated to a relatively high PSI. It is also lightweight and can be folded and reused. Also, PVC seams can be welded instead of stitched providing a superior construction compared to glue. This is why PVC is one of the go-to materials for inflatable kayaks. Nitrylon is another widely used material. It is much more eco-friendly than PVC and is essentially synthetic and natural rubber coating a 1200D fabric. This creates a puncture and abrasion resistant system that is easy to patch and stronger than PVC. The only downfall is that it is heavy so it is usually used on the bottom and sides of kayaks where it regularly comes in contact with the ground. Most inflatable kayak reviews agree that the weight of your kayak is among the most important of considerations. Being inflatable ensures that these are easy to transport – and is the best option for solo users. Being lightweight ensures that you are able to further transport your kayak with ease, thus increasing your ability to use it. It is also an important consideration when going on extended trips that may require portaging. A typical inflatable kayak will be around 12 feet long. This gives them good stability in the water while allowing them to fit two people. Inflatable Kayaks can be as long as 16 feet while being as short as 10. These different sizes allow them to do different things. Just keep in mind if it is just you setting this kayak up. A longer one will be more difficult to get to the water and may require a kayak dolly to assist you. This feature is usually found on whitewater inflatable kayaks. A self-bailing system is essentially holes at the bottom of the kayak that lets water out of the hull. The downfall to this is kayaks that do not have plugs will let a little water back in when on calmer waters. 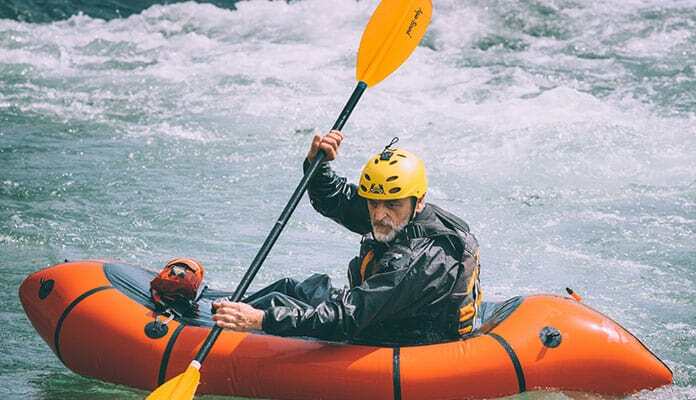 If you plan on using your kayak for rapids we recommend looking for a self-bailing system which has plugs or a one-way valve which will not allow water to flow back into the kayak. The weight capacity of your inflatable kayak can vary between 350 and 700 pounds. When looking to purchase one you should consider what you’re using it for. Are you going to be transporting more than one person? If you are going to be transporting people from the shore to a sailboat, for example, you should factor this into your decision. If you are going to use this kayak to get to the hard to reach fishing spots you should think about how much gear will you pack with you and how heavy it is. You might not want to bring someone with you every weekend, but it may be nice once in awhile. A second seat can also be a good place to put a cooler for drinks or your tackle box and rod for fishing. A second seat is also great if you are going out on the water with kids or bringing a dog along for the ride. They can experience the front seat and be on the water with you. 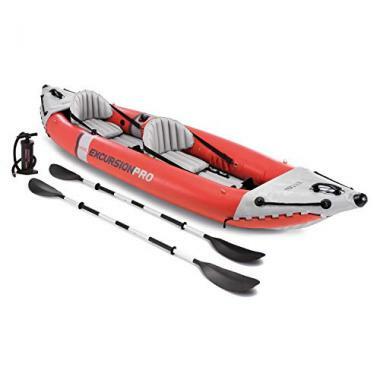 Inflatable kayaks usually come in a package that includes everything you need to get on the water. These packages make inflatable kayaks affordable because you don’t have to purchase everything separately. A pump is required to inflate the kayak to it’s recommended PSI while it needs a skeg – a fin system – to keep it on the right path. Up to two paddles and seats are included to get you moving along the water to places you never imagined. These paddles are double sided and are the same that are used on rigid kayaks. Some kayaks even come with removable skegs. These are essential fins on the bottom of a kayak that helps you navigate through the water. This will help you to go in a straight line and is a great feature, especially for new paddlers. If you are an avid fisher keep your eye out for kayaks that have rod holders. These will allow you to fish in comfort and not have to worry about holding your rod all day long. Some have vertical holders while others even have trolling ones, and since there is no motor you don’t have to worry about scaring the fish away. Since these are highly capable kayaks we strongly recommend to bring enough life vests for every person on the kayak. These will come in handy in dangerous water and can actually save your life. When you are looking for your next kayak there are a lot of options to choose from. Deciding to opt for an inflatable kayak, you will find you are faced with many advantages. This preferred type of boat excels in portability and versatility. With so many advantages, it is no wonder so many paddlers are turning to this style boat. This style of kayak lacks the heavy plastic of most kayaks making it a much lighter option. The lightweight materials used to make these best inflatable kayaks makes it so that almost everyone can transport it with ease. This makes it even more accessible for people. As inflatable kayaks often stretch longer than 10 feet long, storing them can be difficult. With an inflatable kayak, you can simply deflate it to fit into a backpack or duffel bag. This makes them small enough to fit almost anywhere. Being able to store your kayak on a shelf or closet is specifically ideal for those that live in apartments or areas that have less storage. Having an inflatable kayak opens up doors for you to paddle in even more places. You will no longer be limited by roof racks and places your car can go. Their small size allows you to pack your kayak on your back and bring it with you everywhere you go. These kayaks often come with a duffel bag or carrying bag included. This allows you to bring your kayak with you on flights, trips and to remote locations. This feature will help you get even more use out of your kayak. Inflatable kayaks are one of the most versatile types you can get. They are not only great for everything from lakes, to rivers to even whitewater, but are also super easy to store and transport. You don’t need a huge garage to keep this safe. If you have even a small apartment you’ll be able to simply throw in in a closet and it’ll be out of the way. When you want to go to the beach you can load it into the trunk of a small car and still have room for a cooler as well. You don’t have to worry about as much maintenance with an inflatable as a rigid kayak. For the most part, they will bounce off rocks without being seriously affected. But at the same time inflatables are more susceptible to puncture. This is why most companies include a repair kit. You should also ensure your kayak is dry before packing it up. If you store it when it’s wet it could accumulate mold and mildew. This can make the kayak start degrading before it should. To combat this plan to spend a little longer at the beach as your kayak dries. You can even bring a towel to dry it before packing up. Having an inflatable kayak means you will no longer have to store your inflatable boat exposed on the top of your car. Instead, you can deflate it and store it securely in the trunk of your car. This means that you will not have to worry about it getting stolen or be forced to go straight home before and after your trip to the water. The peace of mind you will receive from having your kayak secure will be a welcomed thing when it comes to transporting your kayak. It is important to decide if you would like a solo or tandem kayak before starting your search. If there is a chance that you will be paddling with someone else, you will be better suited to go with the best tandem inflatable kayak. These are ideal because they can easily be paddled solo as well. Simply move the seats around to be in the center of the boat for an easy solo paddle as well. Going with a tandem inflatable kayak will provide you with the best options. 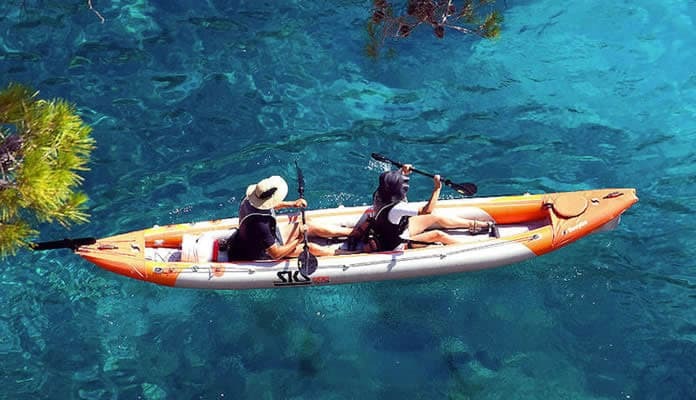 Not only is this type of kayak ideal for those looking to bring along a friend, but they are also a great way to bring along even more gear. You can even bring your dog along for your paddle. 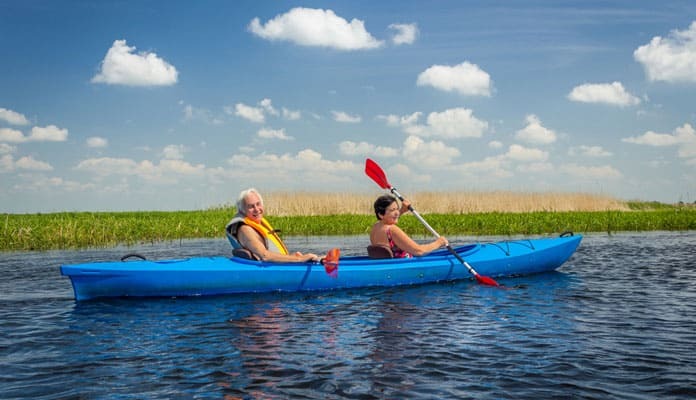 This type of kayak is especially ideal for families. Some inflatable kayaks even allow you to carry up to 3 people. Are You Going To Use It While Fishing? Many fishermen turns to kayaks to get to the best fish. This small boat breathes leisure allowing you to maneuver into the middle of a calm lake with fishing gear on deck. Some kayaks are much better for fishing than others. Many fishermen enjoys using sit on top kayaks as they allow you to move around with more ease. For those looking to fish you will want to get a stable boat with a lot of storage as you will likely have a lot of gear along with you. The water type will play a large role in determining the right kayak for you. If you plan on using it in calm water the kayak will need different features than one being used on the ocean. If you can’t comfortably fit into your kayak you will not use it. It’s best to know that you can sit in it without having to bend your knees to do so without discomfort. This can be determined by looking at the dimensions of the kayak. You can even measure your leg length when sitting so you will be 100% sure the kayak is right for you. How Comfortable Are You Getting In And Out Of It? The kayak you choose will need to be able to enter and exit. You should ensure the center of gravity is lower so it won’t tip in rougher waters. Knowing how to enter a kayak from the water will also need to be something you learn as well. Mother Nature can affect the type of kayak and it’s accessories you need. If you live in the Pacific Northwest you will want to invest in a bailing system to keep your kayak from filling with rain water. Spray skirts will also ensure rough water doesn’t fill your boat with water as well. Do You Need A Self Bailing Kayak? Self bailing kayaks have a one way drain valve that ensures your kayak doesn’t fill up with water. Kayaks with self bailing systems will never fill up with water. These are typically designed for rougher conditions like white water and ocean situations. This system isn’t necessary if you don’t plan on paddling through areas like this. Just like regular kayaks, inflatables have different categories and shapes. We suggest thinking about what you will use your kayak for before your purchase as the styles will differ depending on your use. This type of kayak is where you sit higher than the other styles. People who are claustrophobic and don’t like to feel trapped should strongly consider this make. Your feet are not inside the hull which makes it easier to get in and out. Keep in mind that this can be a wet ride even in the smallest wake. We recommend using this type in warmer weather places and in still water where the water is warm. It is also less sturdy than other kayaks so it will require you to have more skill and core muscles. Looking like the typical kayak, the sit inside type will perform very similarly to its more rigid cousin. This kayak will keep you dry even in rougher water as your feet are not exposed. This allows a more sophisticated bungee system because it has the space over your feet to work with. Some of these have the ability to add a spray skirt for really rough water and colder days. For those looking for a partner when on the water look for a canoe style kayak. This has the shape of a regular kayak but give you the portability of an inflatable. Coming with two seats and storage space, this is a good way to get to the hard to reach places for a weekend trip. Instead of the regular kayak paddles you can use dedicated canoe paddles. These are only one sided paddles. 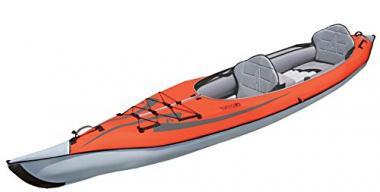 Featuring higher sidewalls and lower seats the open style kayak is the shape of a canoe, but the stability of a kayak. This is usually a one seater and uses the dedicated kayak paddles. The deck on this type is completely open but can have a spray cover available for the high wake. Kayaks will have specific functions and features in regards to the type of water they are made for. For example, an inflatable kayak made for white water will not perform as well on flat calm water. An inflatable kayak for whitewater will have specific features for the fast-moving water. It usually will not have a tracking fin as it could hit rocks and give you too much steering. These kayaks will also have the self-bailing option that kayaks meant for flat water will not have. We recommend looking for kayaks that have a watertight storage option if you plan on entering the class III rapids with gear. When paddling in the ocean it is recommended to have a longer kayak. This will give you the stability and support for traversing large swells. These will typically have high sidewalls that combat rough water and spray from the wind. 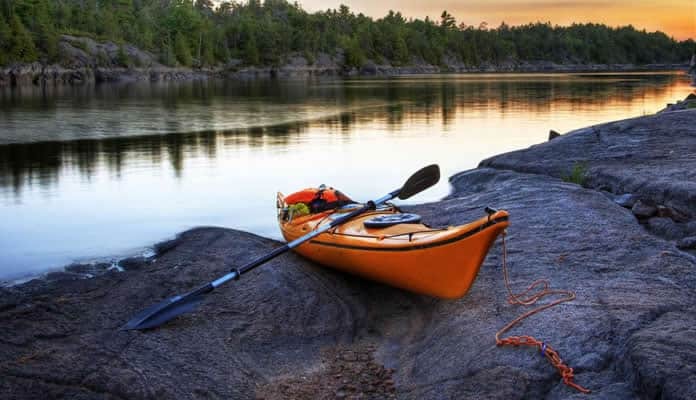 Kayaks that are designed for flat water such as lakes have lower walls, possibly an open concept, and lots of storage space. Not having to deal with high waves or rough conditions allows them to focus more on the experience and not keeping you safe and dry. If you are trying to get to the island in the middle of the lake for a secluded weekend this is your best ride. Q: How Much Do Inflatable Kayaks Cost? A: Inflatable kayaks can cost anywhere from $150 to over $1000. There is such a large range of prices due to the quality of the kayak. 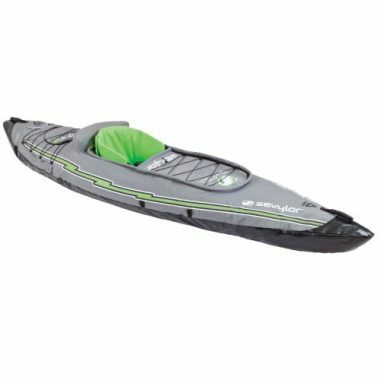 An inflatable kayak package (which includes a pump, carrying bag, paddles, and a patch kit) will fit right into the middle at around $550. Q: How Do I Inflate A Kayak? A: You can inflate your kayak in a number of different ways. It likely came with a hand pump but if that doesn’t suit you, you have other options. You can use also use a foot pump if you have back or upper body problems. This type of pump is much easier to operate. If you have an electric pump lying around or are willing to invest the money in one this is definitely the easiest way to go. This type of pump can be plugged into your car and do all the hard work of inflating your kayak. This allows you to get into the water faster. Be sure to check your kayak to see what type of valve it has for inflation. Q: How Do I Paddle An Inflatable Kayak? A: It may feel foreign to be in an inflatable kayak the first time you hop in but the truth is they are much the same as plastic ones. Oftentimes, they are even more durable. Paddling in one is exactly the same as if you were in a traditional kayak. A double sided kayak paddle makes this easy. Q: How Do I Choose An Inflatable Kayak? A: The first thing to decide is if you want a traditional style sit-in kayak or if you would prefer a sit on top kayak. Both have benefits and largely depend on your intended use. For example, if you would like to use your kayak for fishing you will be looking for one with special features. Deciding if you need a tandem or single kayak is also important. From there, choose the kayak with the right weight limits for your intended use and your desired amount of storage. The Intex Challenger K2 Kayak, 2-Person Inflatable Kayak Set checks off all the boxes as one of our favorite inflatable kayaks on the market. As a bonus, the price is right! Q: How Long Do Inflatable Kayaks Last? A: Your inflatable kayak can last just as long as plastic kayaks if cared for properly. They have nearly endless positive features. When caring for your kayak, be sure to wash it after every use. This can be as simple as hosing it off after every use. This should be done when paddling in fresh water as well as salt water as there are microbes in the water that can cause mildew growth. Once your kayak is rinsed you should allow it to fully air dry in the shade. Following that you can deflate it and store out of direct sunlight. This will greatly increase the lifespan of your kayak and allow it to last for many years to come. Q: Are Inflatable Kayaks Durable? A: Yes! With more and more people going towards inflatable kayaks rather than hard ones they are being made better than ever. Using high quality military grade PVC these kayaks are built to last. Being easy to store and transport you run less of a risk of your kayak being damaged as it features more protection than before. The material used for these are so thick that you can even bring your dog with you on your trip. Q: How Do I Find A Leak In My Inflatable Kayak? A: If your kayak seems to be losing air you may have a leak. If you have no idea where it is you can simply look for bubbles. This may mean that you have to get in the water along the shore to get a better look. Start at one side and work your way around the boat. If you still can’t find it take your gear off and flip the kayak on its back. Do the same – look for bubbles starting at one side and work your way around. Pro Tip: Keep in mind that if you inflate your kayak in the morning the air pressure can fluctuate during the day. You may not have a leak and just have to give it a few more pumps of air. Q: How Do I Patch An Inflatable Kayak? A: Your inflatable will come with a patch kit in case you do experience any damage. While these inflatable kayaks are incredibly durable and are likely to not experience any issues, it is always good to be prepared. Patch kits will come with marine grade super glue and all the tools you need to do the job. After locating the hole you can simply patch it up with lots of glue and head back into the water. Q: How To Dry An Inflatable Kayak? A: The biggest draw to inflatable kayaks is that they are incredibly easy to store. While this is true, you will want to take special care when deflating and storing your kayak. It is important to not store a wet kayak. Instead, waiting until your boat is completely dry before deflating is important. Otherwise, you may risk some water getting caught in the folds of your kayak which could cause mildew to form. When maintaining your kayak, we always recommend allowing the time for your boat to air dry naturally. Be sure to put your kayak in a covered area that is away from direct sunlight and allow to dry. Avoid putting your kayak in direct sunlight to dry. This will cause your kayak to fade and show wear at a much faster rate. You will want to put your boat upside down in order to drain any sitting water. While you can towel dry to speed the process up, we don’t recommend relying on that solely as you will likely miss quite a few spots. Q: How Do I Modify An Inflatable Kayak? A: Inflatable kayaks aren’t meant to be modified like a traditional kayak. You can’t drill a hole in the shell and add a cup holder or fishing rod holder. But there are things you can do to make an inflatable kayak better for your use. Accessories will become your friend. This can range from waterproof bags to anchors and even paddle splash guards. You can even get inflatable pontoons to add more stability to your kayak if you want to do things like fish with it. Q: How To Get Back In An Overturned Inflatable Kayak? A: Getting into an inflatable kayak from the water is a crucial skill you should know before getting on the water. Nobody wants to have to do this but understanding how to can save your life in a bad situation. This will be the same as a rigid kayak. You will want to get behind the seat, pull yourself out of the water while swinging your leg over the entire width of the kayak. When you’re on top you will want to put your hands stretched out in front of your legs and shimmy your way towards the cockpit. Once you are close enough put your legs inside it while you use your hands to balance and stabilize your body. Q: How To Clean An Inflatable Kayak? A: It is important to maintain your kayak when not in use. When done properly, cleaning and maintaining your kayak doesn’t take very long and can greatly increase the lifespan of your boat. You will want to clean your boat after every use with special attention to it before you deflate your kayak and store. This will help to prevent mildew from growing on your kayak. To clean your kayak, you should be able to simply hose your boat off with fresh water. This is important to help get the salt off your boat when heading to sea. Even if you are paddling in lakes you will find that microbes attach to your boat making it incredibly important to clean. Using your hose thoroughly rinse your kayak while it is still inflated. Make sure to allow your kayak to thoroughly dry in a shaded area. You will want to keep your kayak out of direct sunlight as much as possible. This will prevent your boat from fading and help to keep it looking sharp. Once your inflatable boat has been cleaned and thoroughly dried you will want to store it in a cool dry place. Q: How To Fold An Inflatable Kayak? A: When you’re taking your inflatbale kayak out of the box for the first time you will want to take note of how the manufacturer folded it. You will want to mimic this when you pack it up after your day on the water. If you forget how to do it there are a few things you should keep in mind. Try not to fold the seams too much. This is the weakest point on the inflatable boat and any damage to this area will be magnified when it’s fully inflated. Another thing to keep in mind is the bungee system. Ensure it won’t catch or snag when you’re putting it into or taking it out of the bag you store it in. Getting involved in outdoor water sports is a great way to clear your mind and take a new angle on an adventure. Having the top inflatable kayak will ensure that you are able to make the most of your new activity. Being easy to transport with a lightweight design makes it so that solo adventures are more easily accessible. Inflatable kayaks are also a great idea for those who live in smaller square footage or don’t have roof racks. After all, kayaking shouldn’t cost tons of money and is the best option for a great time crusing down the river with your friends. A great way to go fishing or for long distance paddles, these are made with a highly durable material ensuring you are able to enjoy your day on the lake to the fullest. They will take you to places you never thought possible. Always wanted to paddle to the other side of the lake? These are the best inflatable kayaks that will get you there. Do you have any of the best inflatable kayaks on our list? Let us know how you like it in the comment section below.